I hope everyone had a wonderful time over the holidays! My bf and I were definitely spoiled from our family, they actually got us plane tickets home for Christmas! Over everything that was my absolute favorite thing that happened recently. Even with our plane getting delayed… twice! It was definitely an experience, and bright side when we got stranded in another city we were put up in a hotel until they could get us on another flight. I know many who were not as lucky as us. Although I have that nasty habit of cutting it short, I always get it done! So lots of fun crochet patterns coming your way! 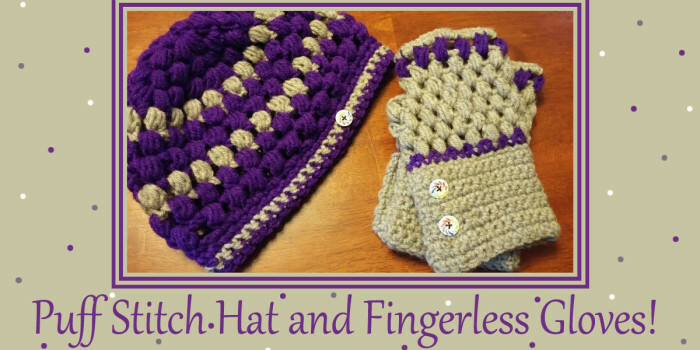 To start out I have this Puff stitch hat and fingerless gloves. 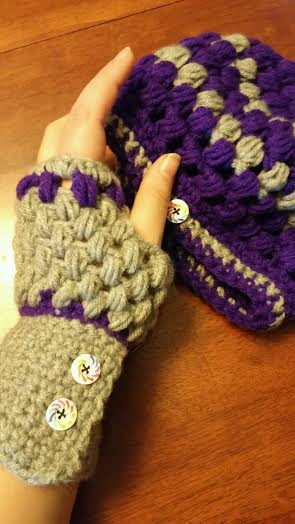 I love how these look, and the puff stitch is always so soft! 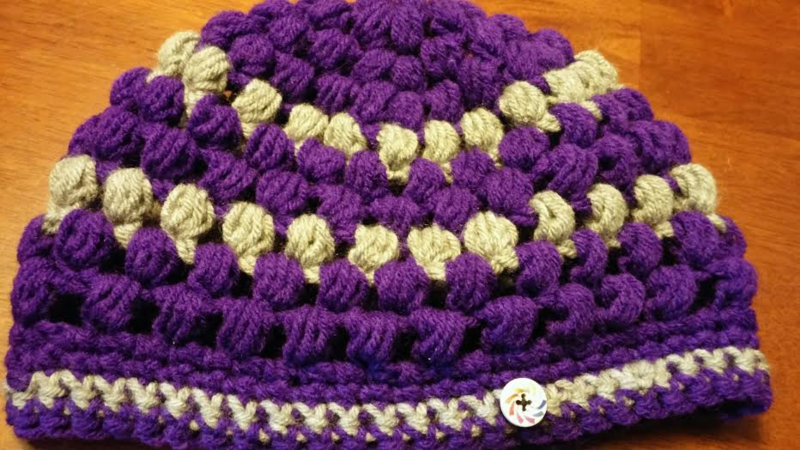 Even better, this pattern is so simple even beginners can do it! ♦ Buttons- at least 5, 2 for each glove and 1 for the hat. 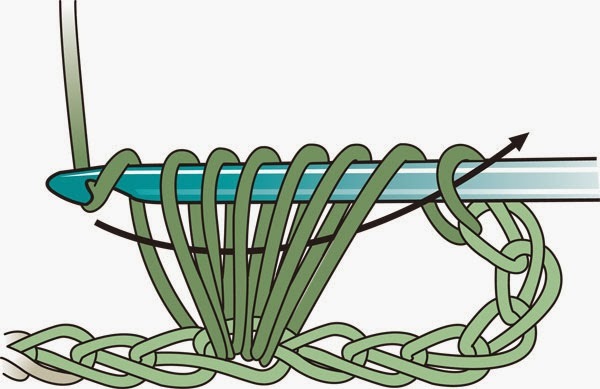 To make a puff stitch wrap the yarn over the hook and insert the hook into the next space. Wrap the yarn over the hook and draw through. You want to pull the hook up a little bit so that the puff stitch is nice and loose. There will be 3 loops on the hook. Repeat the process in the same space until there are 7 loops on your hook. Wrap yarn over your hook and pull threw all 7 loops. chain 1 to secure the stitch. This picture nicely shows how the loops should be pulled up. The only difference is this puff stitch is being created on a chain while ours will start by pulling the first loop up. Ch5 sl st in first ch to make circle. Now that there are no more increases if you are wanting to start throwing in some other colors it’s really easy to start making some stripes. If this is something you are planning then after you sl st together just tie off whatever color your done using. Attach your new color to any space, pull beginning loop up and continue as normal. To make the band ch 1, sc in ps. 2sc in each space. Continue this around your hat, sl st into first sc to join. Make as many rows of single crochets around as you want/need. I chose to make 4 rows for my band. 2 purple, 1 grey, and 1 last purple to finish. To add the final touch sew on a cute button. I make my cuff the same as she does, only I ch 36 rather than 32. When the cuff is fully crocheted I overlap mine by 6 stitches and sew it loosely in place so that it wont pull on the buttons too much. 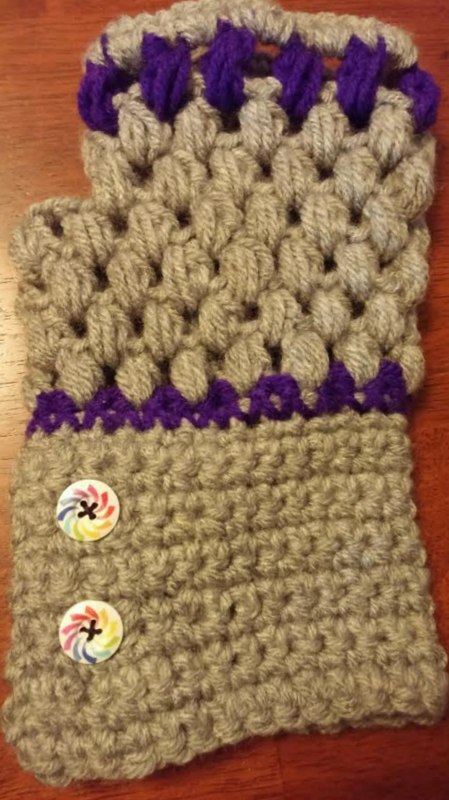 Use matching buttons for your cuffs as you did on your hat. To finish the cuff, single crochet around the edge, I did this in my accent color. Make sure to crochet threw both layers where they overlap! Will have 30 sc’s. I did Row 7 in my accent color, but that is just optional. Row 8– To finish the gloves sc around the top. Attach yarn into space between the puff stitches. Ch 1 and sc. Sc into pf, 2 sc into space between ps. Continue around ending with a final sc in the space you attached your yarn. sl st into first sc and tie off. Tuck in your tails. 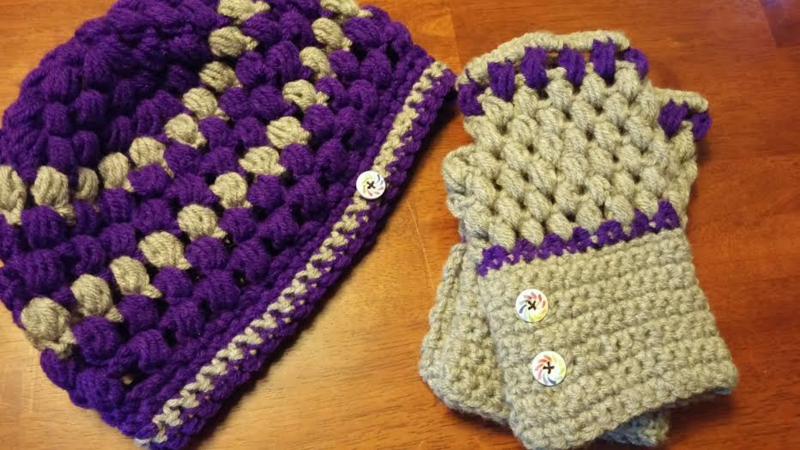 Now you have an adorable puff stitch set to help you fend off this winters cold… while keeping your hands open to be able to function!